Join us every Tuesday through the fall, winter, and early spring to enjoy your favorite Stone Water dishes at a fixed price. 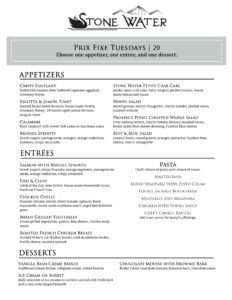 Choose an appetizer, entree, and a dessert from our prix fixe menu for just $29. Looking for a great wine to pair with your meal? 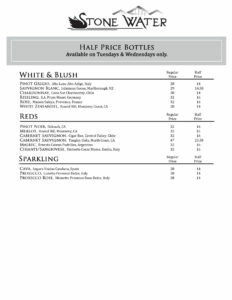 Check out our half price wine bottle menu available on Tuesdays and Wednesdays in the fall and winter.